At the Great San Francisco Dickens Fair, you can meet Father Christmas on the streets of Victorian London. You might run into Queen Victoria or her husband Prince Albert. You can meet Charles Dickens, too — and listen to him reading one of his famous stories. You might see Oliver Twist getting hauled away to prison. And that's only the beginning. You'll find dozens of other characters dressed in period costume, playing roles large and small - from the lords and ladies to a lowly chimney sweep. They're all excited to talk to you and pose for photographs. But their nineteenth-century brains may be puzzled about the device you're taking those photos with. What Is the Dickens Fair? For six weeks before Christmas, the San Francisco Cow Palace turns into a bustling, 19th Century London street scene covering more than 120,000 square feet. It's an elaborate party, to say the least, with hundreds of costumed players. You'll also find seven stages where singers and dancers provide entertainment. If all that wears you out, you can have a beer or other liquid refreshments at four traditional English pubs or the Bohemian Absinthe Bar. Or go for caffeine instead and enjoy a cup of hot tea and cucumber sandwiches at Cuthbert's Tea House (reservations required). Food stands feature British-style classics like bangers and mash, meat pies, or roasted chestnuts. The Dickens Fair is so immersive that it draws you out of the everyday routine for a few hours. Don't be surprised if you leave feeling refreshed and relaxed as if you took a trip to another place. Charles Dickens' London may not have been quite like the Dickens Fair, but it's still fun to spend some time thinking of a bygone era. And the players are there to help you do that. The shops have well-made merchandise, which makes the fair a good place for a bit of holiday shopping - if the people on your list would enjoy what you find. The food is tasty and reasonably priced compared to similar events. 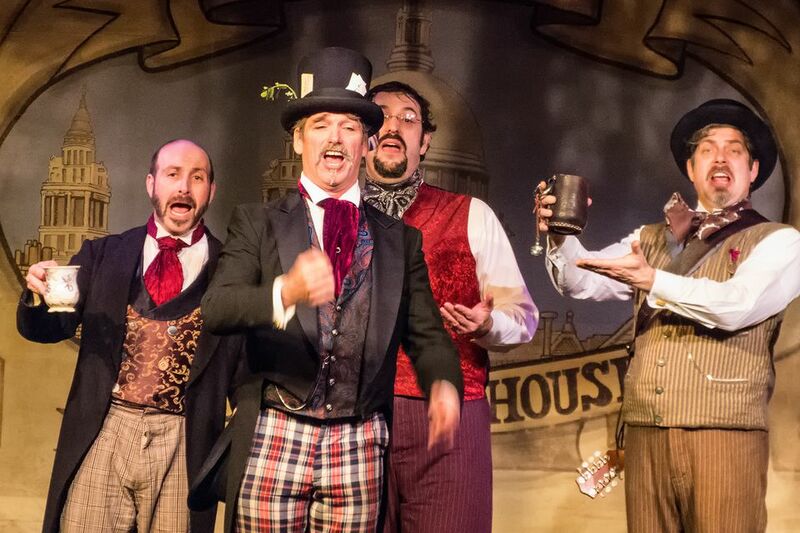 If you don't like Merry Old England, you may not like the Dickens Fair. It's also not the best of places to go if you dislike crowds. Most adults seem to enjoy it. Smaller children with short attention spans may get bored, but others get completely engaged with the goings-on. The Dickens Fair runs for six weekends before Christmas. Details about the dates and hours are at the Dickens Fair website. Admission is charged. Parking is extra and paid at the venue. You will probably spend a couple of hours walking around, browsing and having a bite to eat. If you sit down to watch all the shows, stop in all the shops and have a full meal, you could easily be there for three hours or more. Reservations are not required. You can buy your tickets online and download them to your mobile device or get them at the ticket booth when you arrive. Twilight discount tickets for entry after 3 p.m. are such a good deal that even Scrooge couldn't complain. They are available only at the box office. Cuthbert's Tea Shoppe serves a fun afternoon tea, but reservations are essential. See their website for menus and reservations which they start taking in September. Reservations are also recommended for a meal at the Tippling Toad which can be made at the counter or by emailing thetipplingtoad@gmail.com. The event can draw big crowds, but on a Sunday morning in early December, it can be just right, with enough people to make it seem festive and fun, but not so crowded that moving around is difficult. Bring cash or go hungry. Food vendors don't accept credit cards, but most of the retail shops do. If you arrive by automobile, you'll pay to park. It's a short walk from the parking lot to the exhibition halls which are next to the main Cow Palace. If you don't want to make the walk, you can catch a shuttle that will take you to the front door. If you arrive before the fair starts, you may find parking on the street and avoid that expense. You can leave the fair and re-enter if you get a hand stamp on your way out. Some attendees wear costumes, but they aren't required, The organizers ask you not to come dressed as characters from Dickens novels. You'll find more costume information at the Dickens Fair website. Leave the pets at home. They won't be allowed inside. The fair is accessible to those who have mobility challenges, and they rent wheelchairs by the half-day if you need one. Directions are at the Dickens Fair website from all the main highways. They also have directions using public transit. The fair runs a free shuttle from the Glen Park BART station. The Cow Palace address is 2600 Geneva Avenue.